Philatelic hobby is thriving in India unlike in North America and Western Europe. An important indicator of how well the hobby is doing is the number of new and younger collectors joining the hobby. It also seems that the more collectors in India are primarily interested in 20th century and especially post independence period of India. Fortunately, some of the well known Indian philatelists have written articles and even published specialized books such as “Slogan Cancels of India” by renowned philatelist, Mr. Ashok Bayanwala. There are numerous articles on modern Indian stamps, postal stationery and postal history etc. in India Post, the official publication of the India Study Circle of UK. A major attraction of collecting post independence India postal history is its relatively more abundant availability and comparatively inexpensive cost compared to say 19th century British India postal history especially say 1854 lithographs on covers. 2. Encourage further research and publication of articles, reports or books on different aspects of this subject. 3. Demonstrate that a collector can choose to develop a collection covering a certain dimension of post independence postal history on a relatively modest budget and use the collection to develop scholarly exhibits for both domestic and international philatelic exhibitions. This overview is undertaken through an organized classification which can help collectors to figure out what aspects of post-independence postal history to collect and to organize the acquisitions and to develop suitable exhibits. Another important use of an organized classification would be to further facilitate research in particular areas by fellow collectors. Finally such an organized classification can also guide collectors to develop specific exhibit for a given area of post independence postal history. 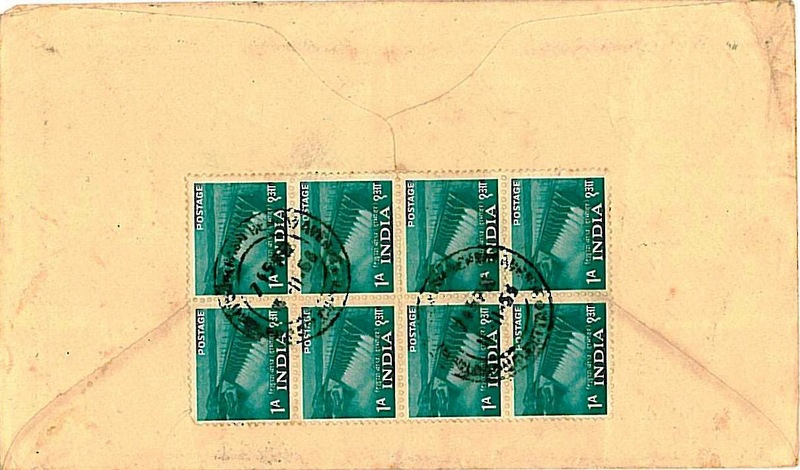 However, the relative affordability of post independence India postal history is perhaps more an indication of limited interest and demand rather than relative availability. An example is the commemorative stamps issued during Rupee-Anna currency period (1947 to 1957) immediately after independence. Conversely, certain categories are both in significant demand and relatively scarce such as the covers from Indian armed forces serving under UN Peace Keeping Forces in Korea, Indo-China and Congo. Before getting into detailed break out of different classifications of post independence India postal history, chronological time line is the most common parameter universally used by philatelists worldwide. a) August 15 1947 to March 31 1957: From the Independence to End of Anna period of Indian currency. b) April 1 1957 to 27 September 1964: Metric Currency Transition. Indian Post Office allowed over six years to identify new currency (i.e. One Rupee = 100 New Paisa) on postage stamps denomination. 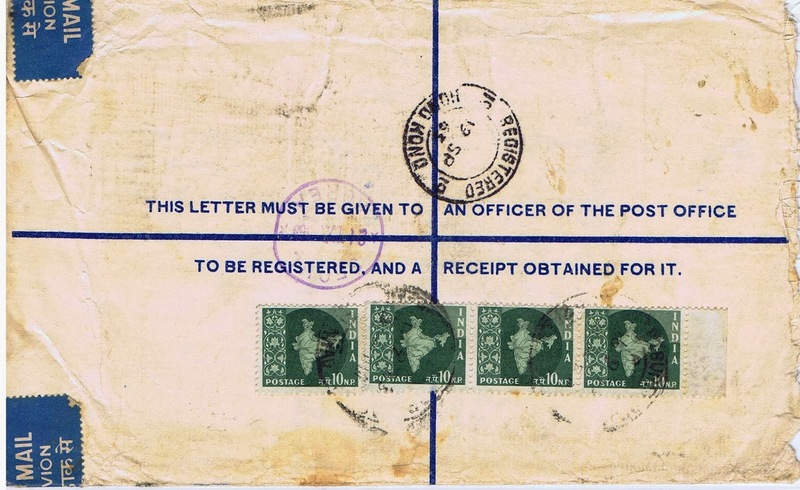 In 1964, the Indian Post Office used both “nP” for about seven years after which “P” was used for Paisa denomination. SG#490 Raja Roy issue was the last one to show “nP” denomination. c) October 1964 to December 31, 1999: Modern 20th Century Period. d) January 1, 2000 to Current: 21st Century Period. i) Types of Postal Emissions. a. Definitive Stamps including experimental coil. b. Commemorative Stamps and souvenir sheets. c. Official Stamps and postal stationery. d. Indian Stamps Overprinted for Indian Army in international peace keeping forces in Korea, Indo-China, Congo and Gaza/Egypt. 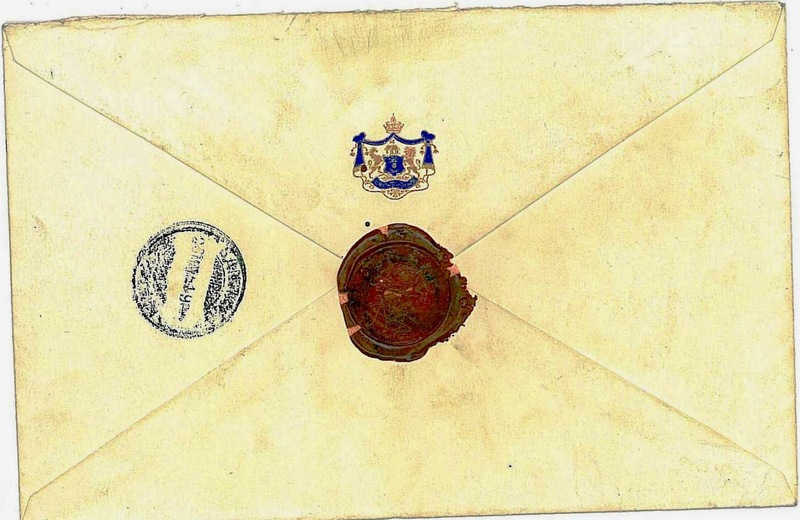 f. Postal Stationery Issues: Postal cards. Postal envelopes, airmail, express mail. 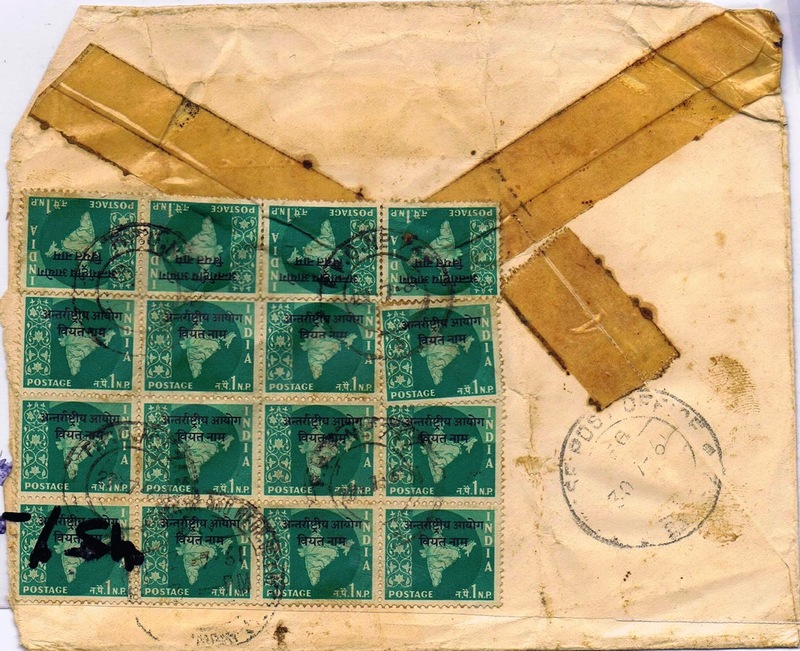 The breadth and depth of post independence India postal history is huge and complex. However, just describing the organized approach above does not help us comprehend what it entails. 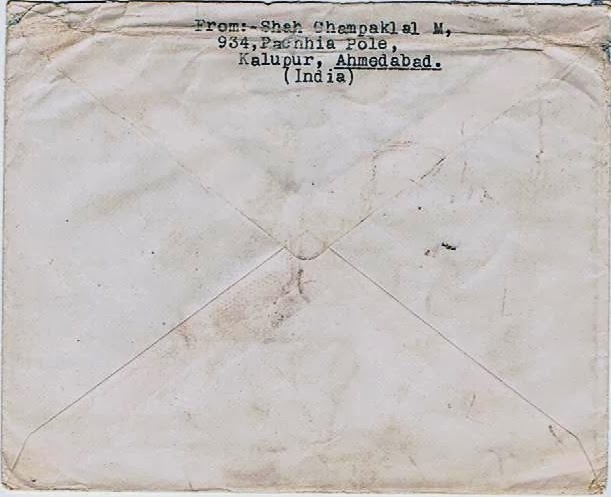 Hence, this article will provide some illustrative examples of postally used covers and cards in terms of different emissions and different aspects of Post independence India postal history. 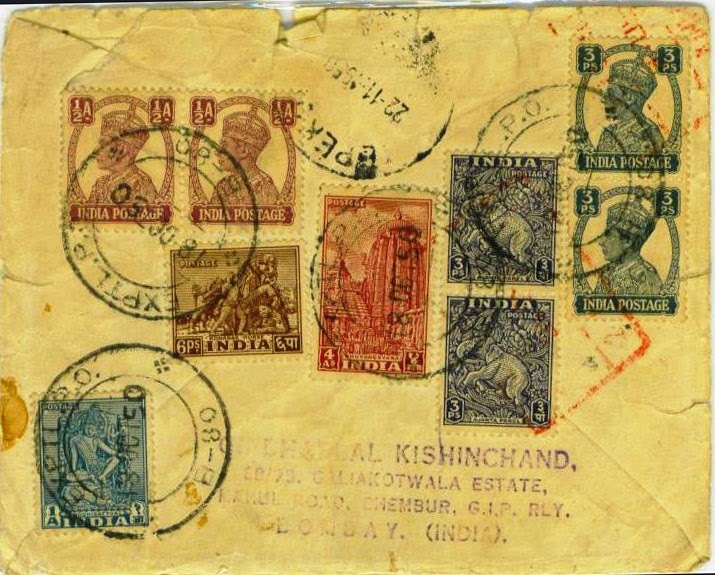 These examples are merely to illustrate the scope, breadth and depth of post independence Indian postal history. This article does not attempt to show examples of every emission and every category of postal usage. Hopefully this article will lead to other collectors and writers sharing their areas of interest. Also, this article reflects examples of Post independence postal history for about first 25 year period from 1947 to 1972. Interestingly, the first definitive stamps were issued two years after the independence. It would be worthwhile to check Indian postal records to determine the reason for such a long wait after the independence. My hypothesis is that at the time of independence, Indian Post Office had a vast stock of British India definitive, commemorative and official stamps. It seems the Indian PO found it economical to use up this inventory before issuing a new set of definitive stamps. Consequently, it was fairly common to not only find British India stamps used post 1947 period but also to see them used in combination with independent India stamps. 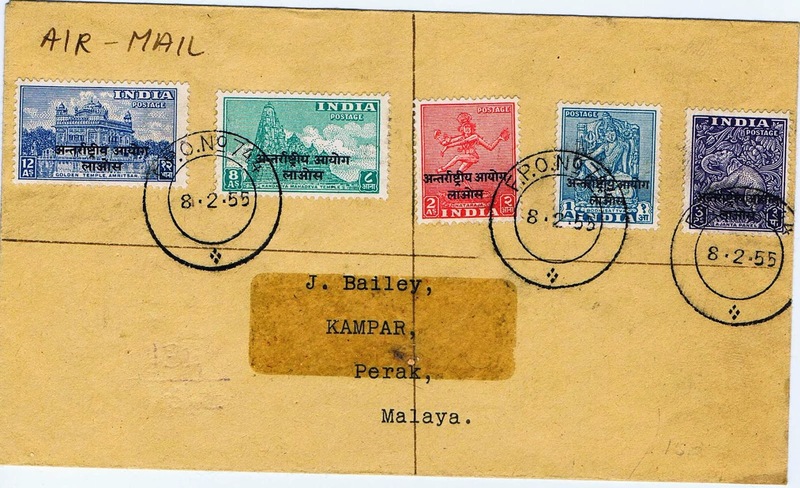 Such combination is called “Mixed-Franking” usage: Another category of mixed franking is the use of Indian stamps in combination with other country stamps which are also illustrated in this article. Mixed Franking Registered Usage: Here are two different examples of mixed franking usages to foreign destination. Mixed Indian Stamps Usage. 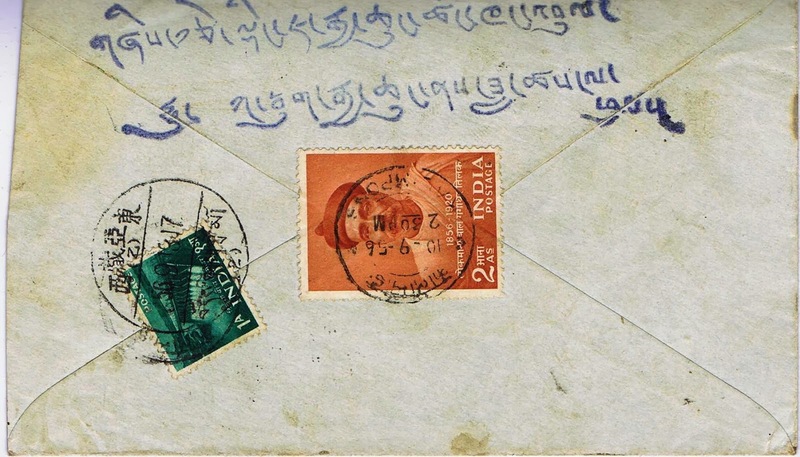 Figure -1A (Front) and 1B (Obverse): This is a registered cover bearing British India SG#265-266 Pair with independent India SG# 309 Pair, 312 and 316 tied by EXP PO B-80 (Chembur, India) sent by surface mail to Ismir Turkey. 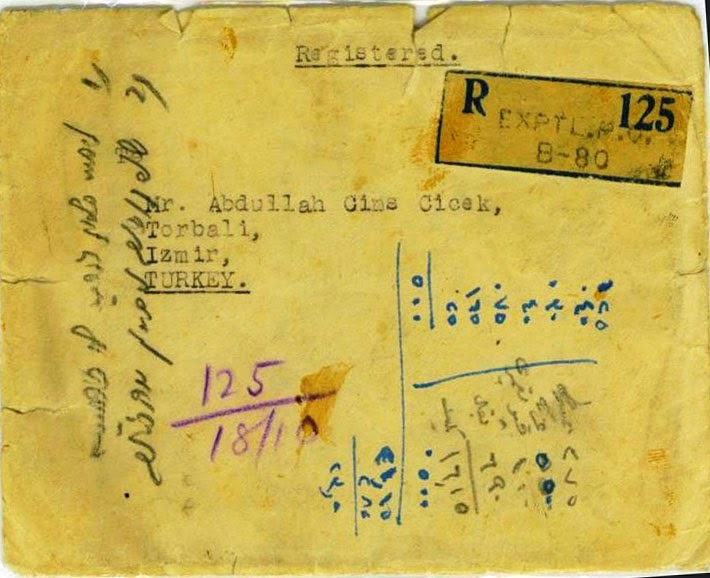 The total postage of 7½ Anna consists of 3½ Anna for surface mail and 4 annas for registration postage. 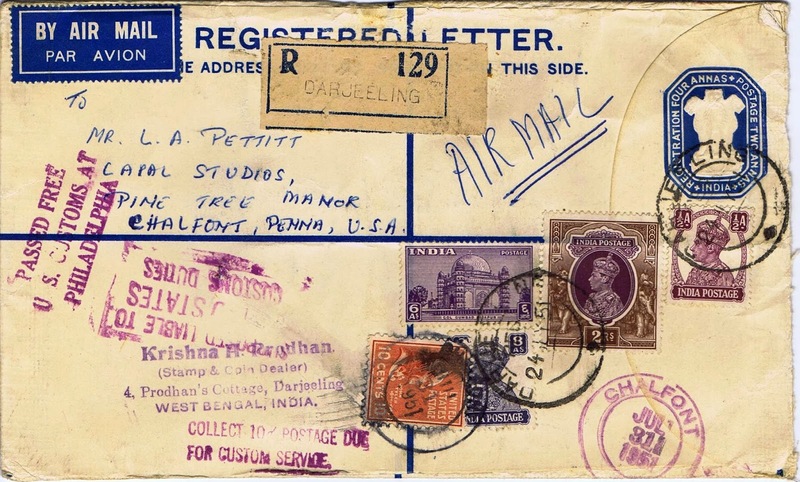 Figure-2: This Registered Cover bears British India (SG#259,267 and 275) used in combination with Independent India Archeology stamp (SG#317) on Independent India Registered mail postal stationery making 3 Rupees, 4 Annas, 6pies for registered airmail postage rate mailed from Darjeeling on 24 MY 1951 to Chalfont, Pa. Upon arrival in the US, the postal clerk applied USA 10c Prexy definitive (Sc#815) to pay for US Customs inspection service which was collected from the recipient. 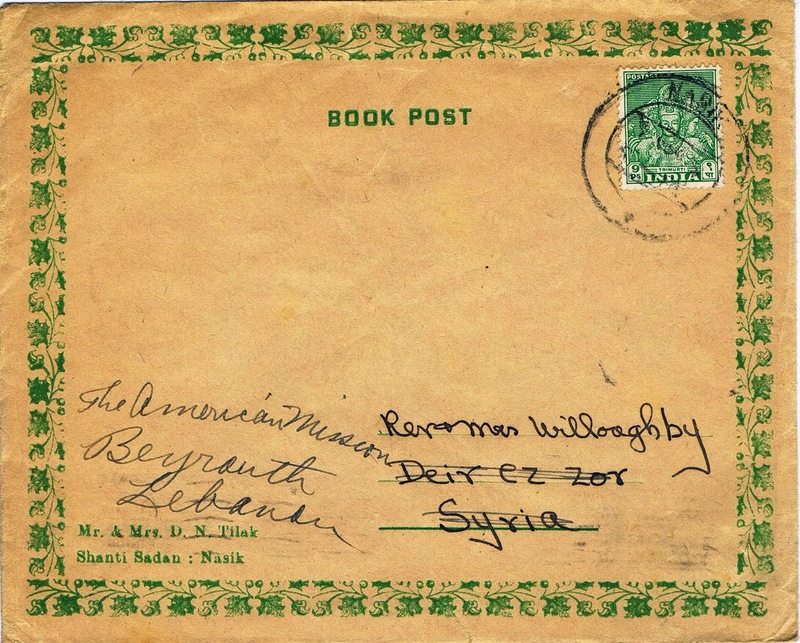 The use of second country stamp typically was either for postage due collection for short fall in postage stamps applied by sender and or for forwarding the mail to another destination during certain period. Use of US postage stamps for other services such as customs inspection is uncommon. Book Post-Surface Mail: Figure-3: Archeology 9 paisa issue (SG#311) used on circa 1950 Book Post cover from Nasik to Syria. Interestingly Syrian Post Office forwarded it to Beirut, Lebanon without charging any forwarding fees. Book Post Airmail: Figure-4A and 4B: This is an airmail book post unsealed envelope bearing block of six of SG#357 (One Anna First Five Year plan definitive) is mailed to Havana, Cuba. This appears to be truly commercial usage and not philatelic. 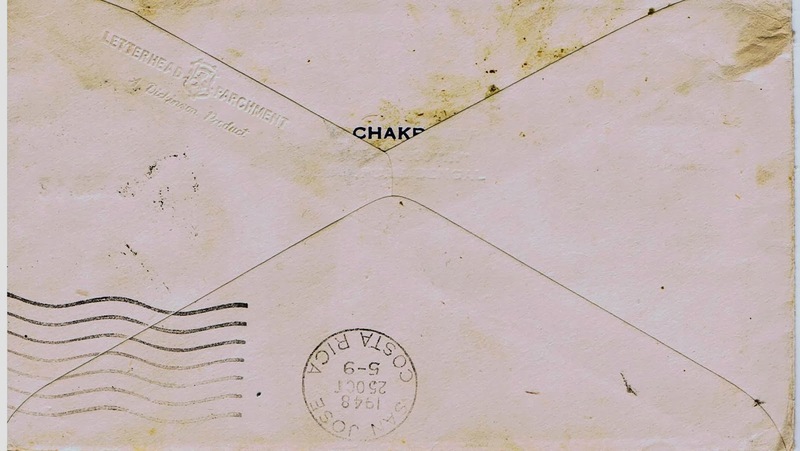 A cover shows Archeology 8annas (SG#318) and One Rupee (SG#320) on a neat 1952 Airmail cover to Beirut, Lebanon. This is One Rupee and 8 Anna airmail rate. A cover shows SG#312 (4anna Republic Issue) with SG#331 (One Anna archeology) issue is used in 1950 to Finland. What was the correct Airmail rate for sending post card to foreign destination? Private post card used to foreign destination are uncommon. Exotic foreign destinations are defined as the ones which with India had relatively limited business, social or cultural communications. Would you consider Falkland Islands an exotic destination? Figure-7 shows a short set of Archeology stamps on a cacheted First Day Cover used to Stanley, Falkland Island. The back of cover does bear the receiving cancel of Stanley Falkland Islands. 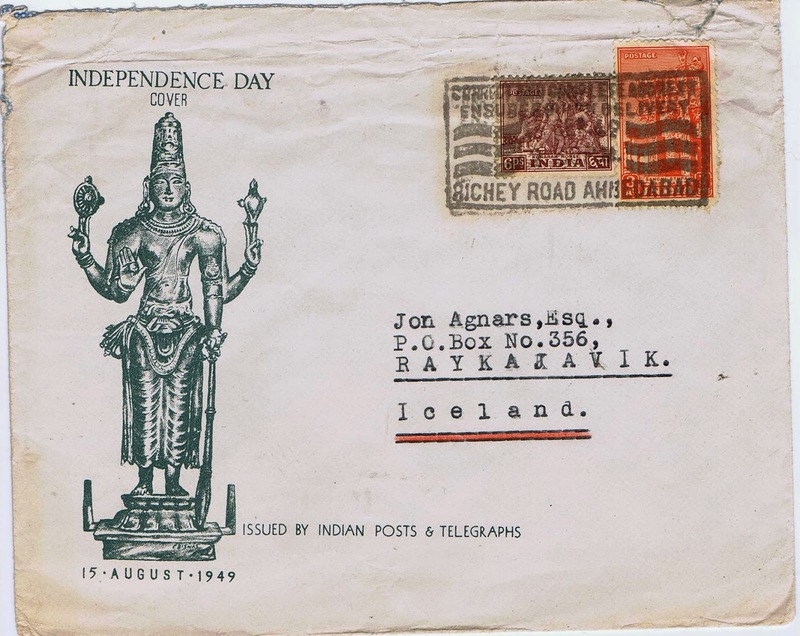 Another example is Figure-8 shows a cover bearing Archeology stamps (SG#310, 312 representing 3½ Anna) used from Ahmedabad to Iceland! However, both covers are most likely philatelic correspondence. Commemorative stamps on covers are very collectible especially if one were to show examples of mint, used and on covers with different types of usages as part of the collection or exhibition. Beyond showing the use of commemorative covers on domestic, international mail and of different categories, one can also show unusual destinations and origins. Let us see some uncommon or unusual usages of early commemoratives. Mahatma Gandhi stamps and its postal history are perhaps very popular and more so when used on cover to exotic foreign destinations. Figure-9A, and 9B shows 1948 Mahatma Gandhi 3½ Anna used correctly (Surface rate to foreign country was 3½ Anna). How often can one find Mahatma Gandhi stamp used to San Jose, Costa Rica? Back of cover does bear receiving cancel of San Jose the capital of Costa Rica. 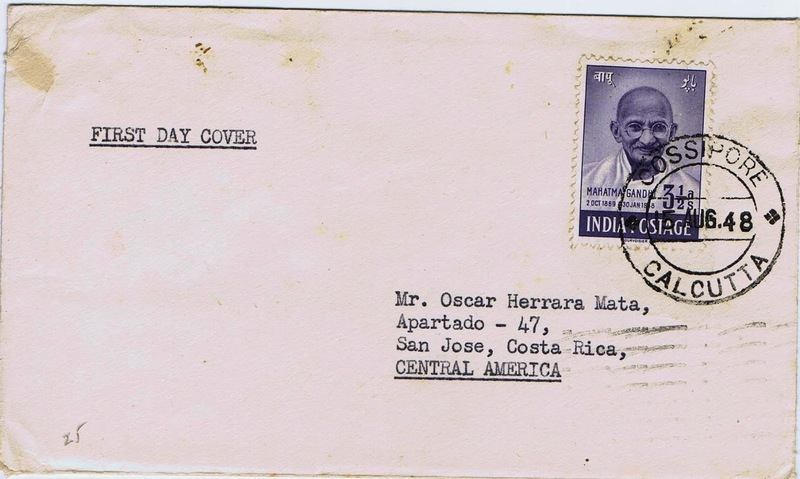 I wonder how many covers bearing Gandhiji stamps are known used to Costa Rica? (a) A second example is the use of Tilak commemorative stamp (SG#374) with One Anna Five Year plan (SG#357) to Tibet (Figure 10A, 10 B). 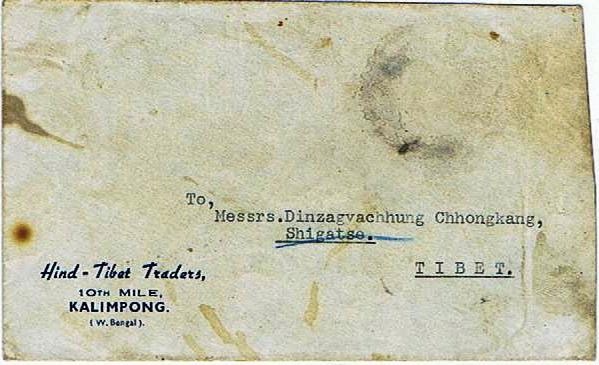 This cover was mailed from Kalimpong on 10-9-56 to Shigatse, Tibet. Interestingly by the cover also bears the receiving bilingual (Tibetan and Chinese) cancel of Chinese Post Office in Tibet. The 3 Anna postal rate needs further explanation. What was the postage rate from India to Tibet during 1956? 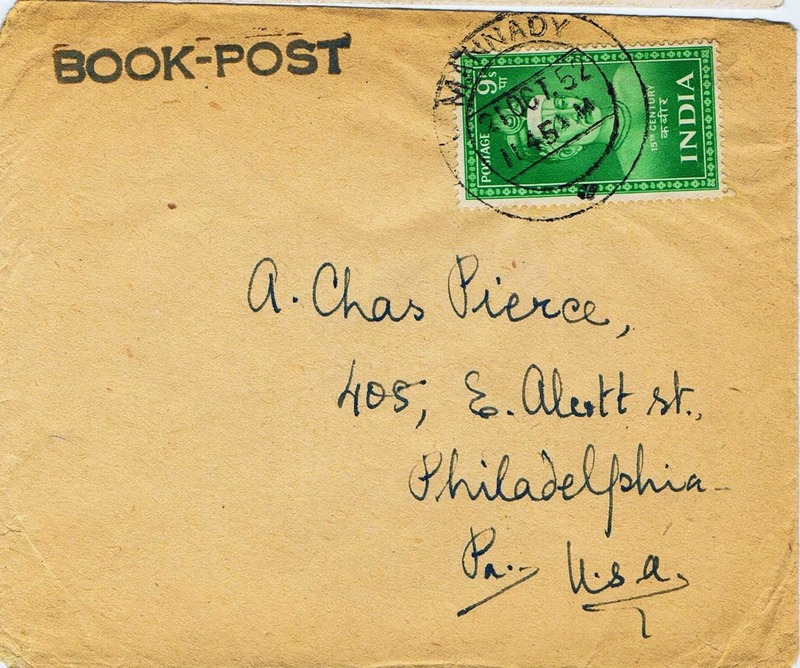 (a) Figure-11 shows the 9p Kabir Poet issue used on Book Post cover in 1952 to Philadelphia, Pa, USA. Low value Poet issue used singly on a cover is quite uncommon and difficult to find. Figure-12 is a Post Independent registered postal stationery envelope (15 paisa postage and 50paise Registration fee with additional postage of Rs 3.45 made up with a strip of 3 of SG#465 (One Re overprint on Kalidas commemorative) with Map definitives (SG#402-5np; 409-25np) used on 1963 registered airmail cover to Busan, Korea..a rather uncommon destination. iv) Indian Stamps Used by UN Peace Keeping Forces: Even though Indian Post Office prepared specially overprinted stamps for use by the Indian Armed Forces assigned as part of UN Peace Keeping Forces in Korea, Indo-China, Congo and Gaza, we have example of Indian commemorative stamps used from such missions. 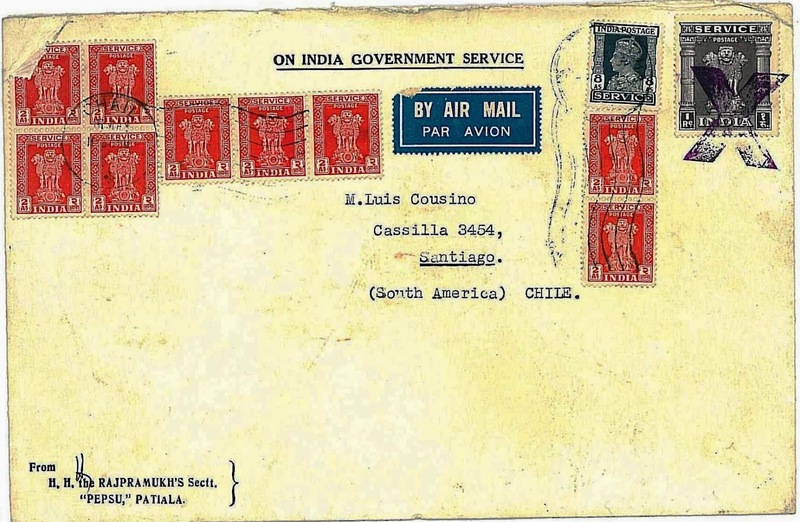 Figure 13A and 13B shows SG 421 (India Exhibition held in New Delhi) used in 1959 from Indian FPO 547 to Amritsar which was undelivered and eventually ended up in Dead Letter Office (DLO) at Amritsar. Official stamps used on covers are fairly common due to large and extensive use. However as a postal historian, one would look for uncommon usages and or destinations. One of the more obvious areas is the use of Indian official stamps on mail to foreign countries representing different categories of postal services. Here we will high light some examples just to whet the readers’ appetite! 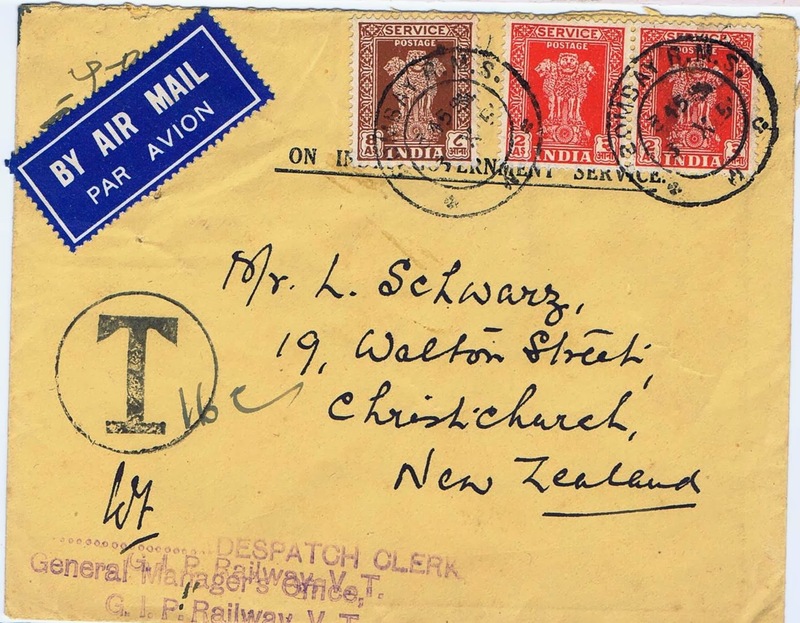 i) Airmail to Foreign Destination: Figure 14 shows SG O155(2 Annas) x2+SGO160 (8 Annas) totaling 12 annas on a 1952 Airmail cover to New Zealand. The cover was mailed from Dispatch Clerk in General Manager of GIP Railway office. The stamps are tied by BOMBAY RMS (Railway Mail Service). Since the cover was short paid (correct postage would be 14 annas), the New Zealand post office collected 16cents of postage due from the recipient. 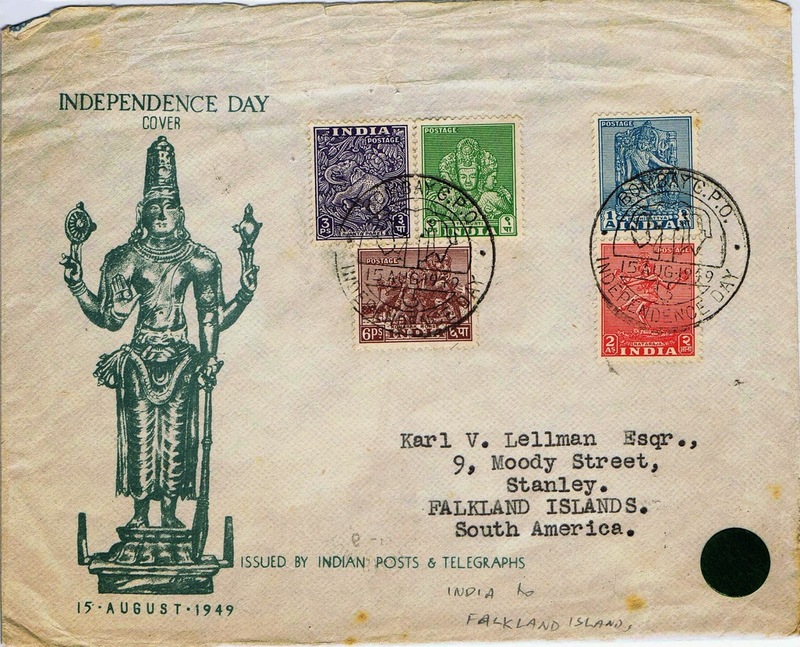 ii) Mixed Franking to Foreign Destination: Figure-15A and 15B shows a nice registered cover bearing mixed franking of British India and Independent India official stamps. 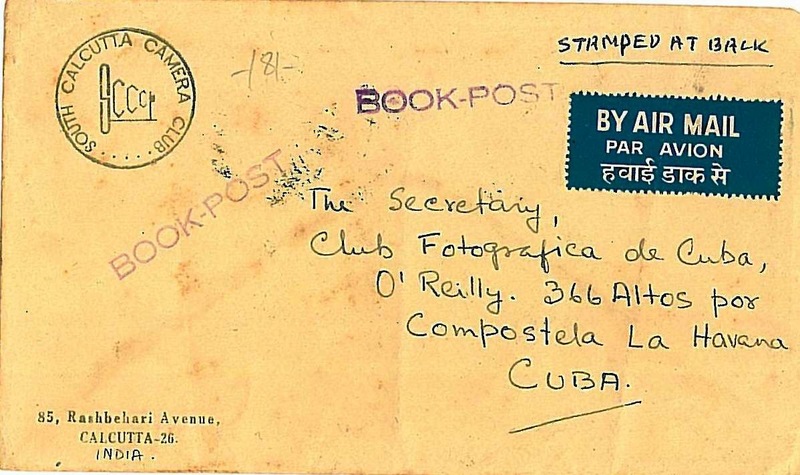 The cover mailed from the office of Rajpramukh of PATIALA State to Santiago, Chile. The cover bears SG#O150, O155 and O161 making up a total of 2 Rs and 10 Annas. 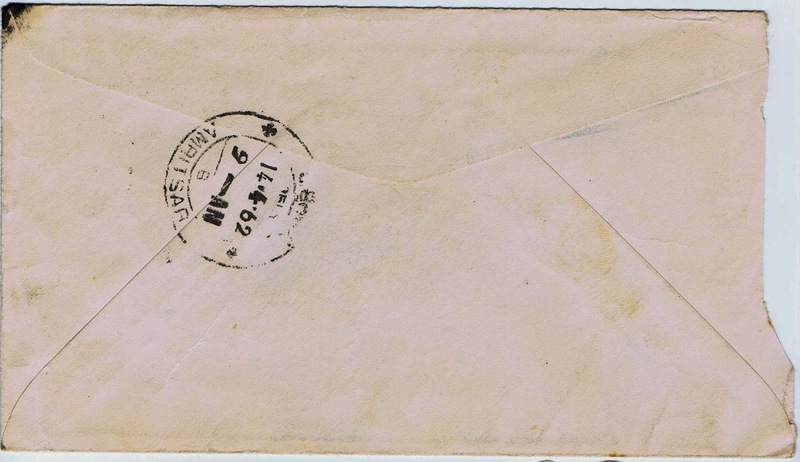 Cover bears the receiving cancel of Santiago, Chile. A very attractive and uncommon use. Please note that correctly used one Rupee official stamp especially to foreign destination such as to Chile. iii) Air Parcel to Foreign Destination: In general full parcel envelope with stamps are not easy to find as they have low survival rate. Also by definition, parcels often bear high value and or large number of stamps to cover very high postage rate. An extreme example is shown as Figure 16A and 16B. 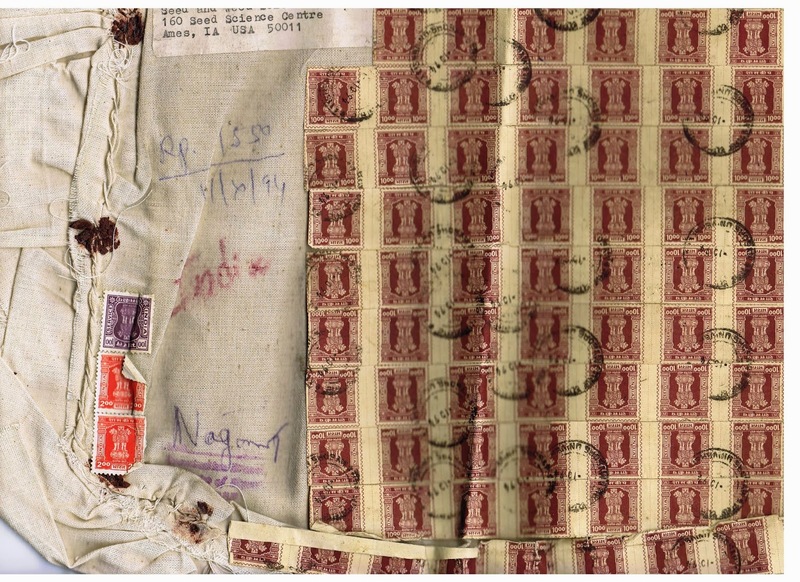 This very large cloth parcel was sent by Airmail and bears a total postage of Rs1,485.00 consisting of 148 of 10 Re stamps; 2 of 2 Re stamps and single 1 Re stamp. 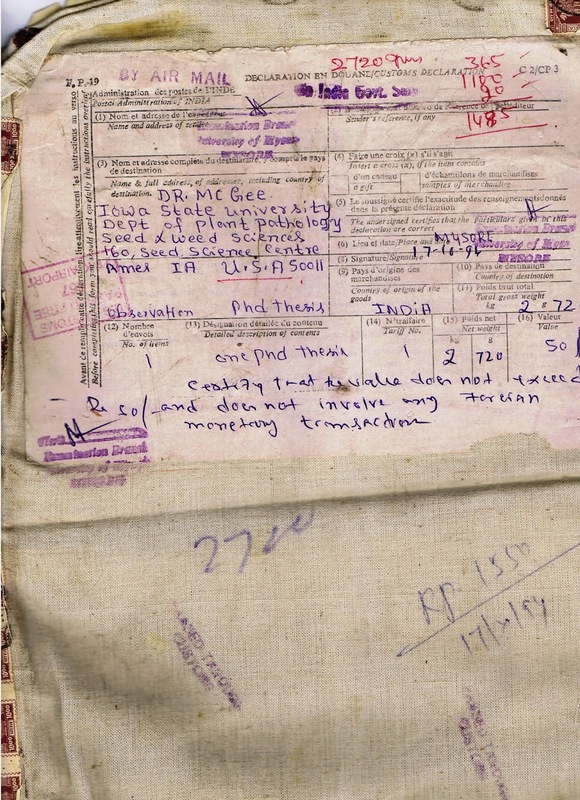 According to customs declaration slip, the parcel contained a thesis from an Indian graduate student (now an Indian government employee) to his professor at Iowa State University in Ames, Iowa. Coincidentally, the author also went to the same university though much earlier. Pre-1947 British India military postal history covers over 150 years and is very popular. Similarly the post independent Indian military postal history especially involving foreign expeditions under UN Peace Keeping Forces is a fertile field for post independent Indian postal historian. 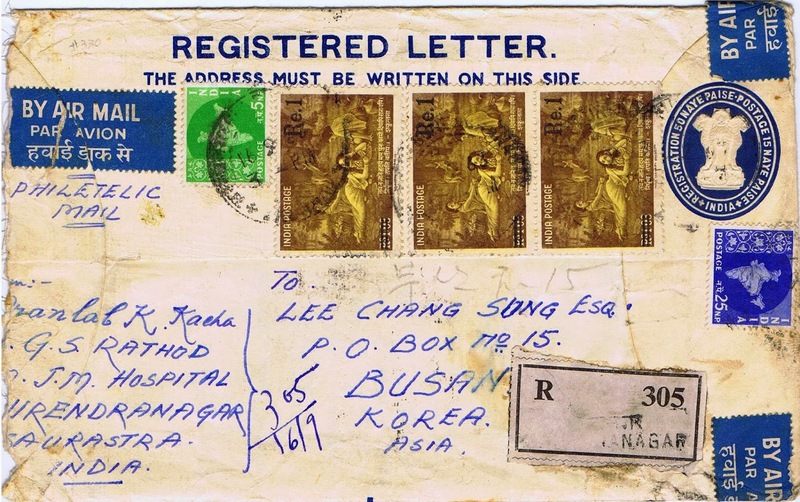 Readers are invited to share their example of commercial covers used from the Indian Custodian Forces in Korea since the author does not readily have one to show for this article. 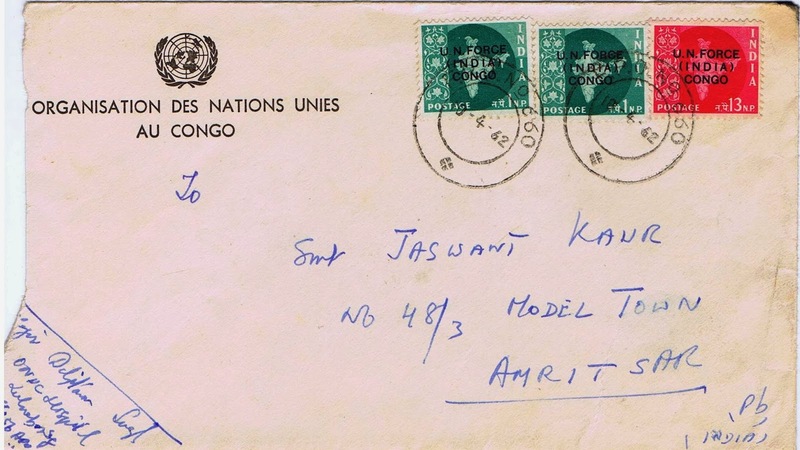 i) Indian UN Forces in Congo: Figure 17A and 17B is a non-philatelic cover bearing India SG#U1(2) and U5 making 15np rate used from Indian Forces under UN Peace Keeping Forces at Indian FPO 660 in Congo. 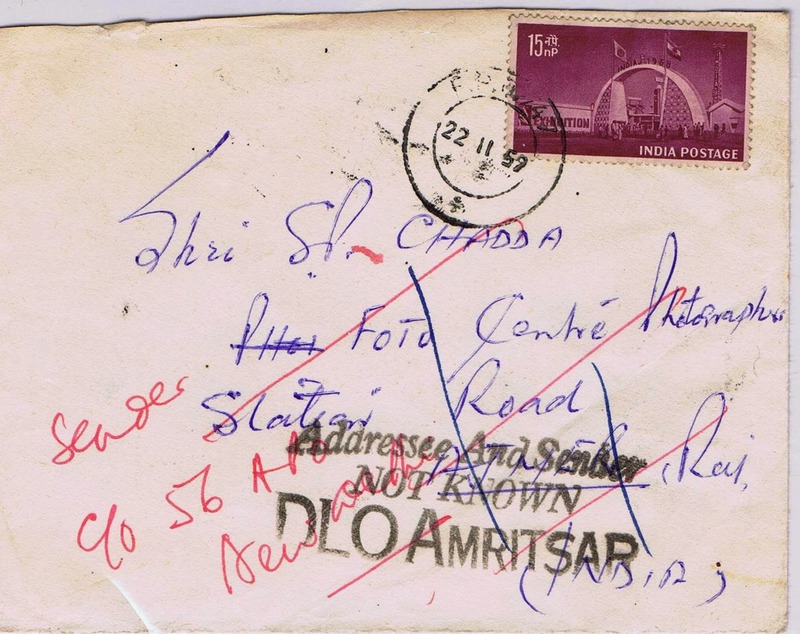 The cover was mailed on 9-4-62 and was received on 14-6-62 in Amritsar as per back stamp. 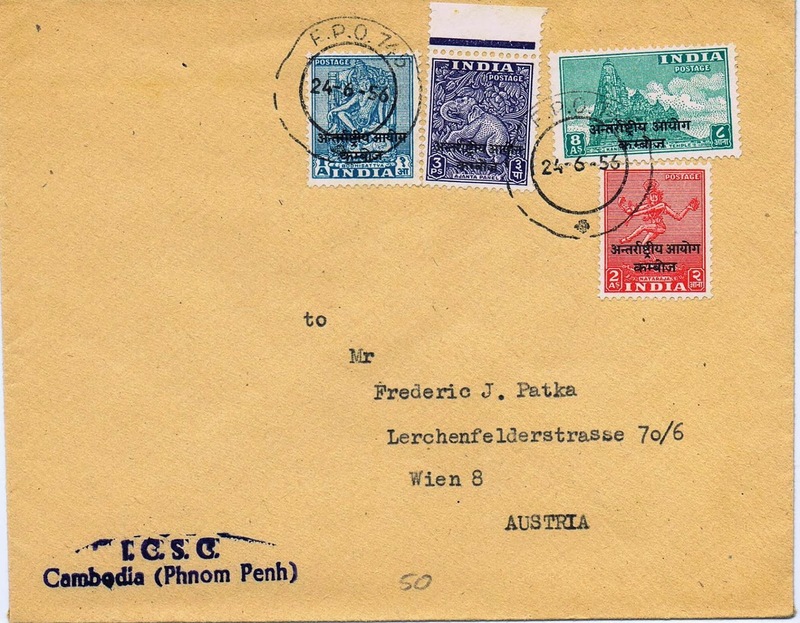 ii) International Commission in Indo-China: CAMBODIA: Figure 18 is a cover bearing SG#N1-N4 used from FPO 745 on 24-6-56 from ISCG at Phnom Penh Cambodia to Austria. The airmail cover bears 11anna and 3pies postage to Austria. Author believes this to be a philatelic cover and is overpaid. 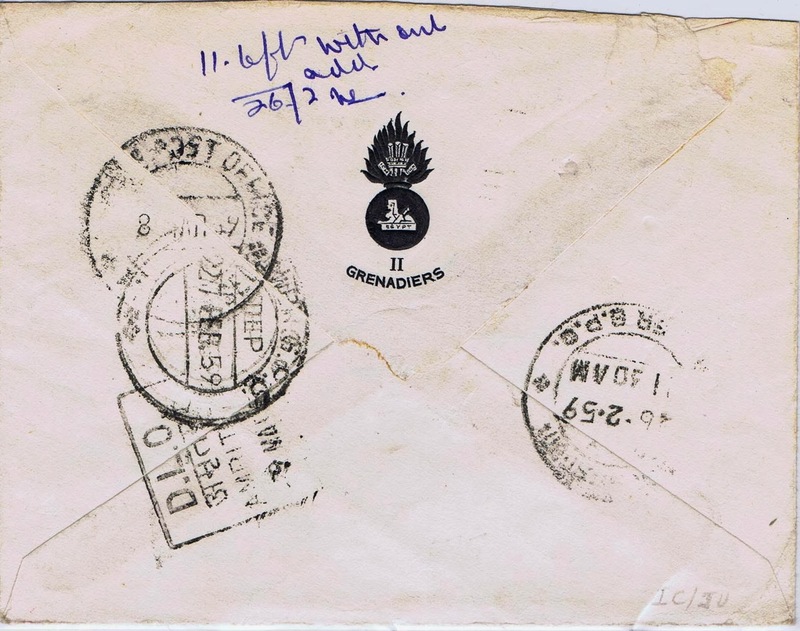 iii) International Commission in Indo China: Laos: Figure 19A and 19B is a cover bearing complete set of SG#N6-N10 used on Registered cover from FPO 744 (Vientine, Laos) dated 8-5-55 and sent to Perak, Malaya. 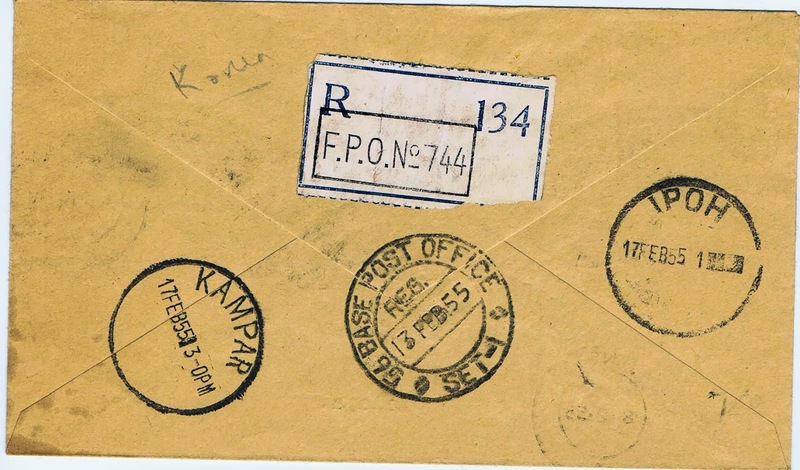 Back of cover (Figure-19B) has FPO 744 registration slip and transit cancels of BASE POST OFFICE (13-2-55), KAMPAR (17-2-55) and IPOH(17-2-55). Most likely this is also a philatelic cover though properly used. Registered mail from Indian Forces under UN Peace Keeping Forces are uncommon. 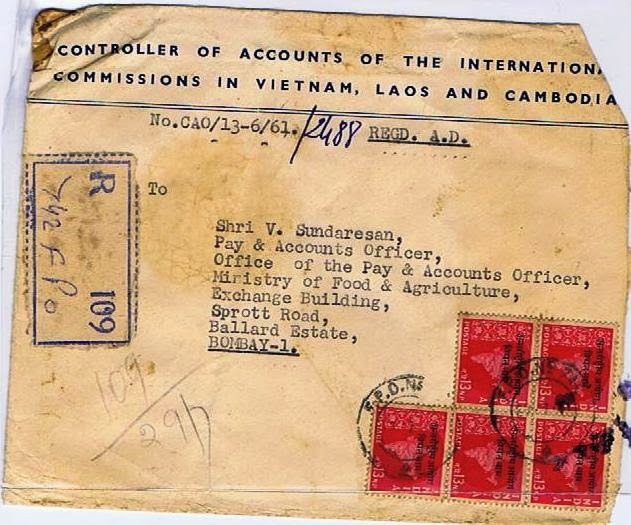 iv) International Commission in Indo-China-Vietnam: Figure20A and 20B is a Registered cover bearing SG#N28 (13Npx5) and N43(1Npx16) used in 1964 on Registered cover from FPO 742 with official corner card of Controller of Accounts of International Commission in Vietnam, Laos and Cambodia. Cover bears a total postage of 81nP and needs rate analysis. Cover was mailed to Ministry of Food & Agriculture in Bombay India. Cover bears Base Post Office cancel dated 30-6-64. Most Indian postal stationery (Postal Cards, Postal Envelopes, Airmail Postal Stationery cards, envelopes Official postal stationery. Only one example is share in this article to whet the appetite. 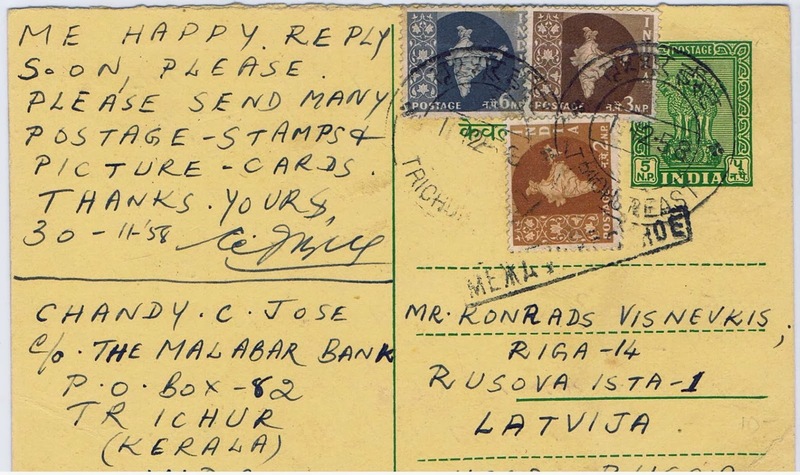 i) Figure-21 is a 5np domestic postal card upgraded with Indian Map series definitive (SG#400, 401 and 403 making 16 nP rate on a 1954 surface mail cover to Latvia. It is hoped that this comprehensive survey will catch the interests of the readers to take pro-active actions. These pro-active actions can range from comments, clarifications or answers to questions raised in this article to digging into their collection to re-discover their treasure and share scans of examples. Or even better, how about contributing to a series articles as a regular feature in the Indian Philatelic literature. Thank you. Note: Readers are requested to send their comments, views, suggestions on this article. Hi, I liked your blog and I invite you to join our website http://www.coollectors.com - The World's Free Collectors Zone. This is the Memories of India before the Independence. This is the Tribute to those peoples who have sacrifice every thing for the Nation. Informative,well explained, with lots of illustrations, helpful for those who have interest in Modern India Postal History.